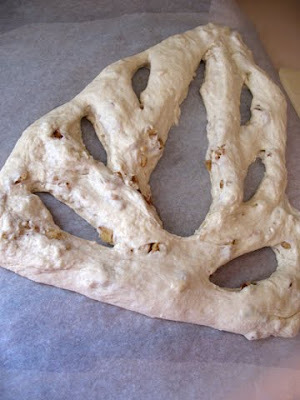 The bodacious Bread Baking Babes are celebrating autumn this month by baking Fougasse, a delightful leaf-shaped bread, at the invitation of Elizabeth of blog from OUR kitchen, our Kitchen of the month. Our regular posting day, the 16th of the month, coincides this month with World Bread Day, the annual event that encourages us to bake bread. We are asked also to honor the fact that we have enough food, a situation that isn't true for too many people in the world. 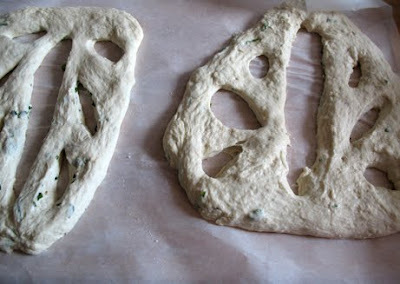 So today we celebrate both World Bread Day and baking with the Babes by baking fougasse, a shaped flatbread. 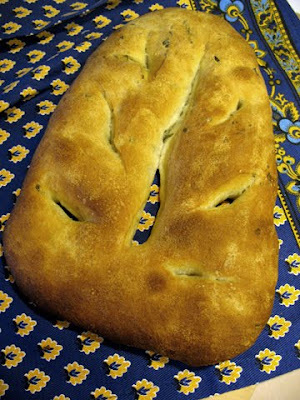 Fougasse is perfect for fall since it is traditionally shaped like a leaf, with the dough cut and stretched in such a way that, once baked, there is a lot of crustiness. That's a lovely thing in a flatbread like this, especially if you are serving it as an appetizer as I did, or with a nice cooler weather soup or stew. Elizabeth gave us a couple of choices for the bread dough but indicated that we could also use our own recipe. I'd posted a foccacia recipe during the winter of 2008 and it used sourdough starter, so that's what I used. It made enough dough for me to make two loaves each of two variations. 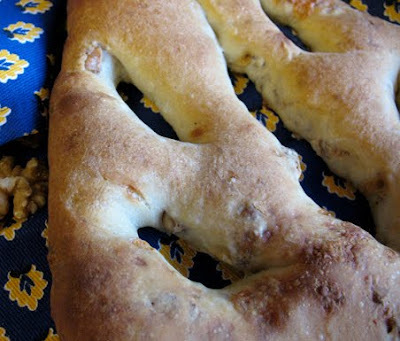 I was inspired by a fougasse that fellow Babe Susan of Wild Yeast had made which used gorgonzola cheese and figs to add flavor and texture to a fougasse which included rye flour. I only used unbleached bread flour... no rye or other fancy flours this time... and paired the gorgonzola cheese with chopped walnuts. The result was awesome! There was no need for any additional butter or oil, although we did find that some slices of Golden Delicious apple went really well with that version of fougasse. As Elizabeth days, "Because fougasse is baked on a stone instead of on an oiled pan, there are more crispy bits. Not too crispy though... it's juuuuust right! 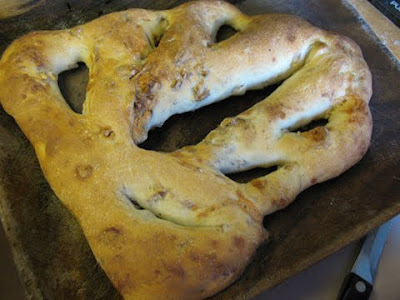 Of course, it can be cut with a knife but we think that fougasse tastes better torn apart." The other half of the dough was flavored with freshly chopped herbs...Italian parsley, basil, and rosemary. 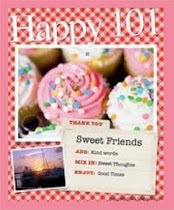 I'm grateful to have not only enough for myself and Sweetie, but enough to share. I gave one of the herbed loaves to our renter because she loves bread and is on a fixed income so it helps her stretch her food budget a bit, too. Seems appropriate as we honor World Bread Day. 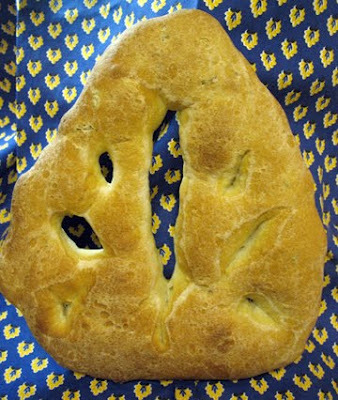 Try baking this easy and delicious Fougasse yourself...you'll be glad you did. There is only one rising, only a few ingredients, and trying out the shaping is fun and gives you another skill in the kitchen. You can choose your own additions or bake it plain and slather on the butter or dip the torn pieces of fougasse bread in a mixture of good olive oil and balsamic vinegar for an Italian touch. If you do bake it this month (by October 29th) be sure and send an e-mail with a link to your post (or a description of the bread and if you liked making it added to the e-mail if you don't blog) and a photo of the finished bread to Elizabeth to become a Bread Baking Buddy. She'll send you a badge and include you in the roundup. I shaped each leaf on a piece of baking parchment which I had laid on a wooden tray. Each was covered with oiled plastic wrap to rise. No corn meal was used on the parchment paper since I slid the bread and parchment paper on to the baking stone, then removed the loaf directly to the stone half way through baking (throwing the used parchment away). 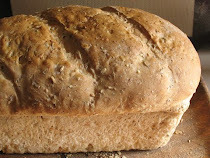 Each loaf was shaped to fit the stone and they were baked one at a time. One day I'll have to spring for a larger stone so that I can bake two at a time. I also added moisture at the start of baking to help with crust development. I put ice cubes into a pie plate below the baking stone, plus sprayed the walls of the oven with water when I put the loaves in. The latter part of the baking time was done without the steam. 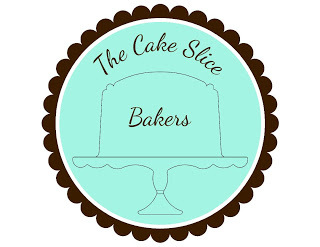 Now that you've heard how I did it, do visit the blogs of the other Bread Baking Babes (see links to the right). I'm also sending this over to Susan at Wild Yeast for the weekly Yeastspotting event. 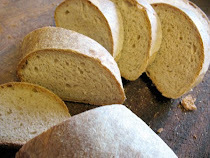 This week is sure to be a good one with entries from lots of World Bread Day posts, so check it out. additions like cheese, nuts, herbs, citrus peels, olives, etc. Punch dough down, turn out of the bowl onto a lightly floured surface, knead a few time to get rid of the extra trapped gas. At this point check out the directions below to make fougasse. 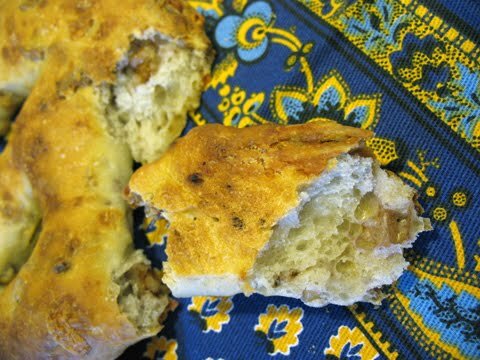 To make focaccia, follow this link. 1 tablespoon EACH chopped Italian parsley, basil and rosemary). 2. If you are wanting herbs/spices on top, please add them just before baking. 7. When the fougasse done, remove it from the heat and allow to cool on a well-ventilated rack. To serve, break it apart and dip it into good quality olive oil with herbs if you want. 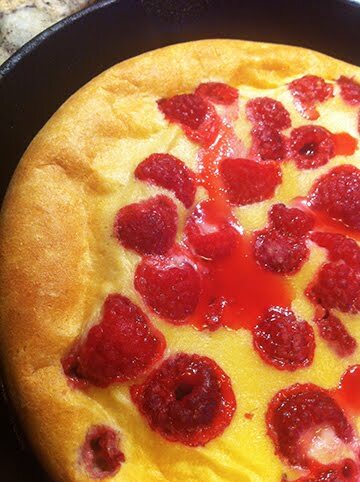 Thank you Elizabeth for a wonderful, delicious, will-make-this-again challenge. My only other attempt at making fougasse was a dud so it was a lot of fun to do it again and discover that it is a great bread. The ultimate test is how quickly it is gone. All four loaves were finished in less than two days (with Straight Shooter having almost a whole one for breakfast yesterday!) so it truly was a success. Sorry, no time for a long comment. I'm on my way to the store for gorgonzola, walnuts and I think some figs! Oh what a great great plan you had! gorgonzola and walnuts and figs.. swoon! Tanna.... get me some if you're going! And I really like how your fougasse is shaped to echo the pattern on the cloth. BBBrilliant. Great flavours! Love the cheese and nuts combo, as well as the herby one. Brilliant! Looks beautiful. Love seeing all these bread shapes. This looks perfect for tearing off chunks to dip in soup and houmous. The perfect mix of crust and fluffy centre. Wonderful earthy fall flavors. Perefect fougasse! Lol, my stone is only sized for one loaf as well. Love your additions!